Welcome to the second Carnival of Space. Below is a selection from recent blog posts about space. I hope you enjoy them. Recently Stephen Hawking floated in zero-g. Joe from Life at the Frontier writes about Stephen Hawking Soaring Beyond Disability. Joe writes that Stephen Hawking's zero-g flight has significance for human expansion into space and for the lives of disabled persons. Music of the Spheres writes about Black Holes and their Dad. Stephen Hawking is one of the best known scientists of our time. He recently floated free inside of a zero-G training aircraft. Dr. Hawking has also done pioneering work on the properties of black holes, which you can explore in an interactive and fun web site called "Journey to a Black Hole." Looking far into the past Universe Today reports on some interesting research on How Dark Matter Might Have Snuffed Out the First Stars. Researchers are proposing that dark matter annihilation in the early Universe overwhelmed the formation of the first stars. At The Daily Brief Brian Dunbar responds to an Apollo Lunar Surface Journal article. Brian points out that we are in danger of losing knowledge regarding the moon from the guys who DID go to the moon. It is amazing to think these men will be pushing 100 years old when we finally get around to going back. Travel to Mars: The Greatest Adventure of the 21st Century the Curmudgeons Corner found an interesting article discussing NASA's long term plans to send humans to Mars. Looking into the future Colony Worlds wonders Is Jupiter's Ganymede A Second Earth? Despite the fact that terraforming may be centuries away, Ganymede may hold the key towards providing a second home for hundreds of millions, if not billions of individuals in the not so distant future. The present is looking better. At Space Transport News is some data on SpaceX Falcon 1 pricing info + Payload Users Guide. SpaceX releases details on how much they will charge to fly on their new rockets. The prices will be lower even than the discount Russian vehicles! And here is some info on the Falcon 9. To be successful in space we’ll need cheaper transportation. advancednano has a post on using Laser and magnetic launches for radically cheaper access to space. The $10,000/kg cost of getting things into space has been crippling what is possible in space. Any low cost system will also need to have a high volume purpose. The focus is on laser launch array systems (and mirror reflecting enhancement). Spaceflight Sandbox ruminates on potential applications for Bigelow's habitat modules and speculates about the possibility of near-term space construction based on materials and techniques derived from the current generation of Bigelow technologies. And finally we go back to the beginning that many of us had with space. As children we often became fascinated with the future frontier of space. The Sinister Scribe remembers how his son became introduced to Mars and space in general in Mommy, I want to see Mars. I hope you have enjoyed the Carnival of Space. 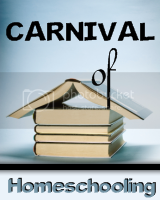 If you are interested in submitting a post for a future carnival, click here for information. If you are interested in hosting a future edition of the Carnival of Space, go here for the guidelines. If you are still interested, contact me. I thank everyone who has helped out with bring this carnival together, and to the participants in this carnival.